It's incredible to see what some people can dream up when given the opportunity. Panduro Hobby is a company that comes up with dozens of DIY project ideas and then shares the instructions on their YouTube channel. The guide below has to be one of their finest — the end product looks like something you'd expect to find in a boutique interior design store. The difference? This one will cost you a fraction of the premade price, and doing it from scratch, you'll be able to make it entirely your own. We've included the video at the bottom of the article, but in case you don't feel like watching, we've broken it all down for you. The first step is gathering all of your tools and materials. 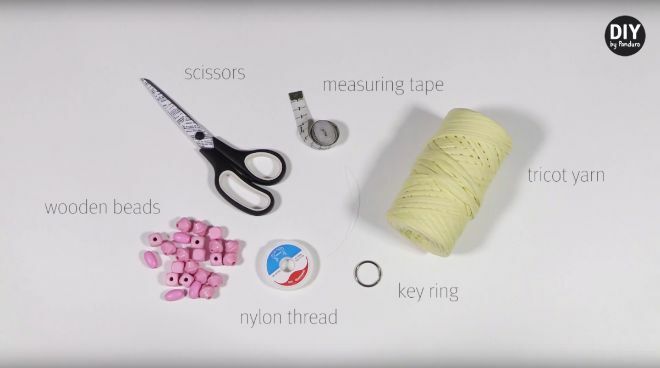 You'll need a measuring tape and scissors to pull it all off, but be sure to pick up a small, attractive vase, some tricot yarn, a key ring, nylon thread, and wooden beads. Next, she measures and cuts her yarn and thread. One string of the tricot yarn needs to be a meter long, and you'll need eight strings that are 2 meters in length. For nylon thread, make four 2-meter strings. 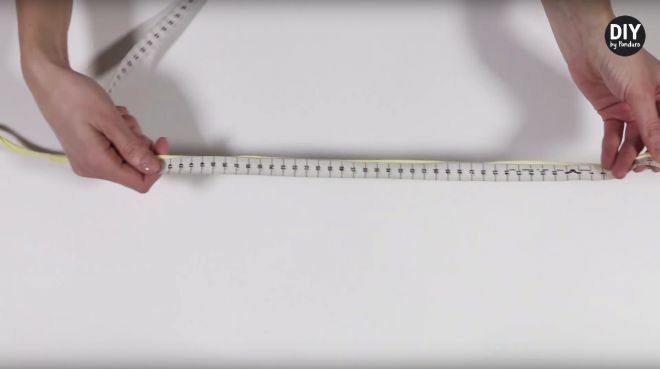 While you could theoretically use a ruler to make your cut, a measuring tape makes things a lot easier. 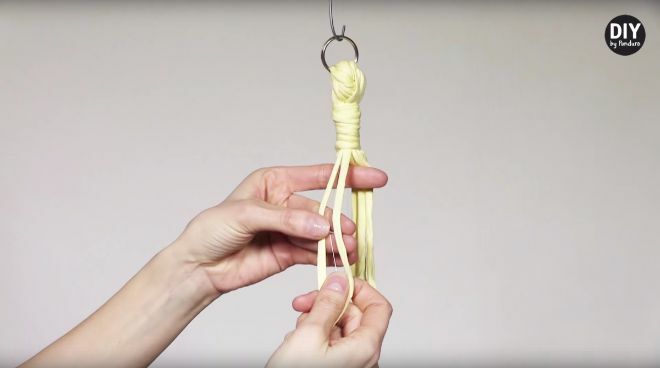 This next step is one of two places where this tutorial gets a little tricky — you'll need to take all of your nylon thread, and every tricot yarn strand except for the 1-meter one, and pull them through your key ring. Once the bundle is all strung through, tie a simple knot through it. You'll have a bit left over on both sides of the ring, and you'll want to pull the shorter side down to run parallel with the rest of the string. Next, grab that last string of tricot yarn and start wrapping it around the bundle. At this point, it should start to look a little bit like a noose. Cut off the excess remaining on your bundle and you'll be ready for the next step. For the rest of the steps in this tutorial, you'll actually want to hang the bundle from the ceiling or somewhere elevated. This will allow gravity to help with the rest of the process. 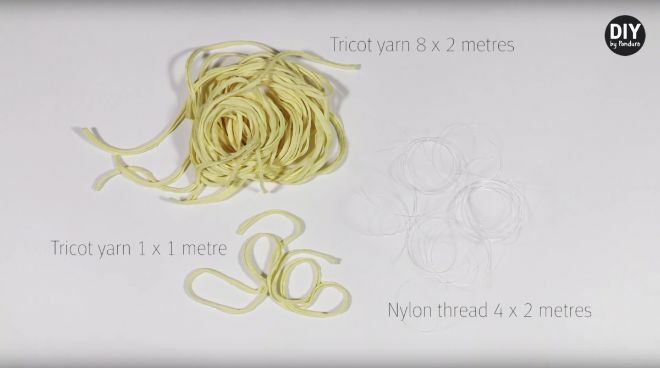 For every two tricot yarn strings, you have one nylon thread. Group these together and tie a knot toward the key ring. 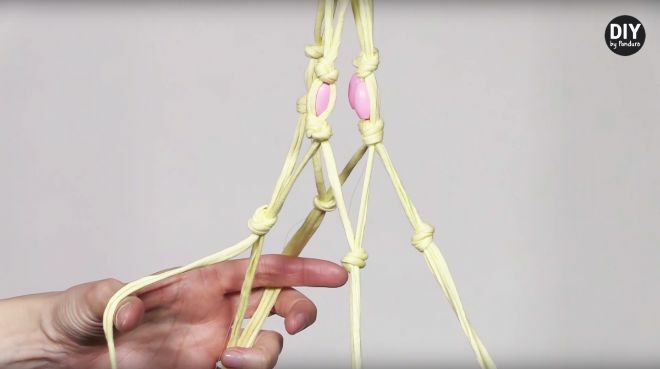 You'll make four of these knots, and ideally, they'll be approximately the same distance from top. After you've tied your four knots, thread each of your [now] four bundles with a wooden bead. As you bring each one toward the top, tie another knot beneath it. To get the desired criss-crossing of the threads, you'll want to separate your tricot yarn and tie each one to the one next to it (not the one it's bundled with — the one in the next bundle). Leave the nylon hanging in this step. Once you've got the criss-cross happening, repeat the step with the wooden beads. If you've made it this far, you're just about nearing completion. Be mindful of how much thread you've got less. You definitely want to leave enough space for your vase. 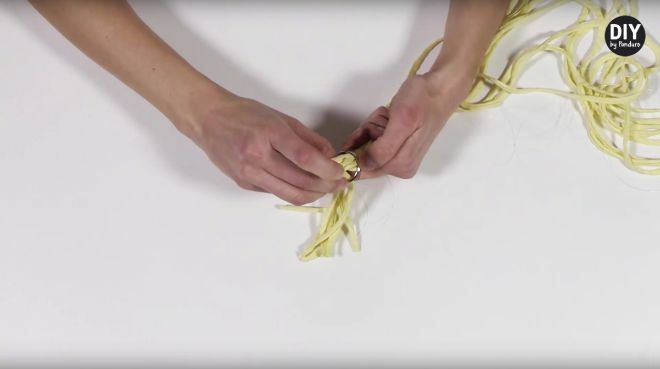 Now, knot off each of your four bundles again — just like you did before the first set of beads. Earlier, we mentioned that there was another tricky part coming. This is it. You're going to want to insert your vase, making sure it doesn't fall in the process. 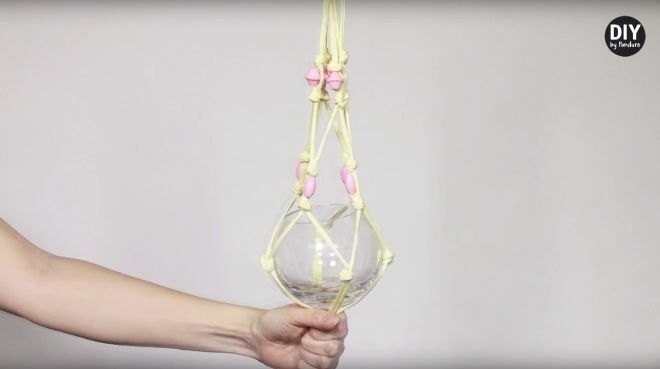 You'll likely have the most luck if you bring the four loose ends together with one hand, and then push the vase through the criss-crossed part above. The bottom knots should line up near the center of your vase, which you can control based on how low you let the vase sit. Once you've determined where you'll need to tie it off, remove the vase without moving the hand securing the bundles. When you bring them all together and tie the knot, the deal is sealed. You've finished your first chic plant hanger! If any of these steps were a bit hard to grasp, don't worry too much — the video below lays it all out plainly. 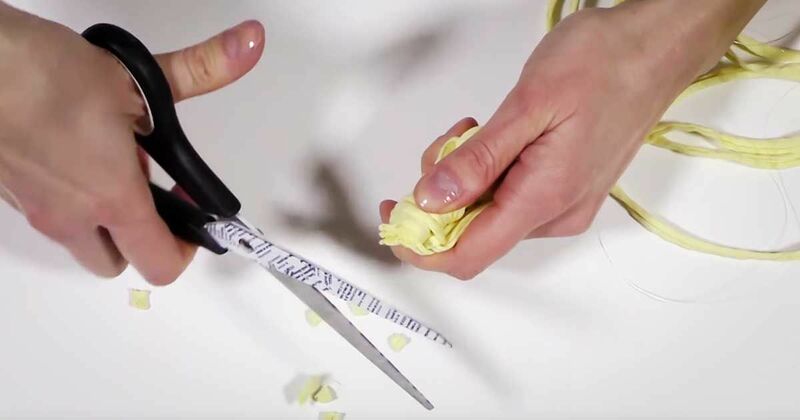 Were you inspired by this tutorial? What might you change to make it your own? Let us know in the comments, and when you're done, be sure to share it with your friends on Facebook. They might like it even more than you did!